Class 12.9 Screws 12.9 class is one of the strongest screws you can find in non-military products. It has proof load of 970 MPa or 140,000 PSI, which is 20,000 more than the US standard Grade 8 at 120,000 PSI. 65mm Holtron Hub-Less Caster All gaming series chairs come with Holtron Hub-less Casters. The 65mm version features roller bearing for pleasing appearance and smooth operation. Caster Silencer The Triigger 275 implements a rubber silencer in the cavity to dampen noise resulting from the friction between the shaft and cavity. This also prevents the caster from falling out by accident. Reinforced DuPont TPEE Mesh Quality textile banded with the finest DuPont TPEE which causes the mesh to withhold high-temperature and heavy hydraulic movements, optimal for long hours of use and breathability. The elastomer in the DuPont TPEE keeps the retention and prolongs the life span of the mesh. Premium Calfskin Leather Exquisitely handcrafted calfskin leather combines skilled craftsmanship with advanced design, cutting, and stitching techniques. The incredibly fine grain leather has a smooth, luxurious texture, creating extra comfort without sacrificing durability. 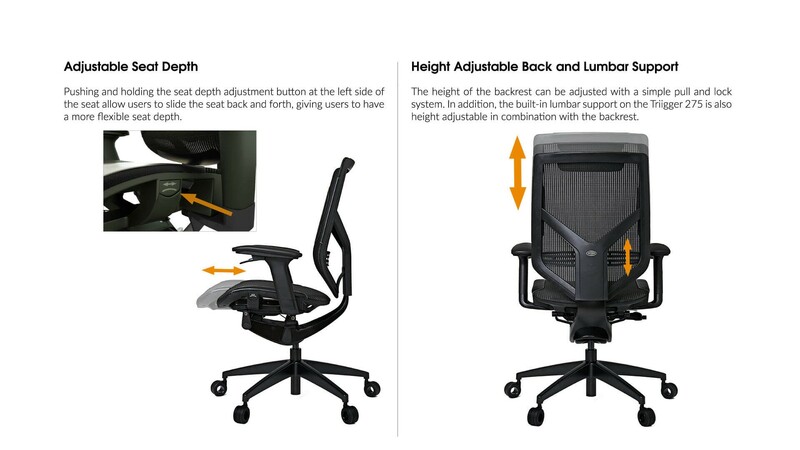 Height Adjustment (Right Armrest) Make adjustments to the chair quickly during intense gaming sessions. 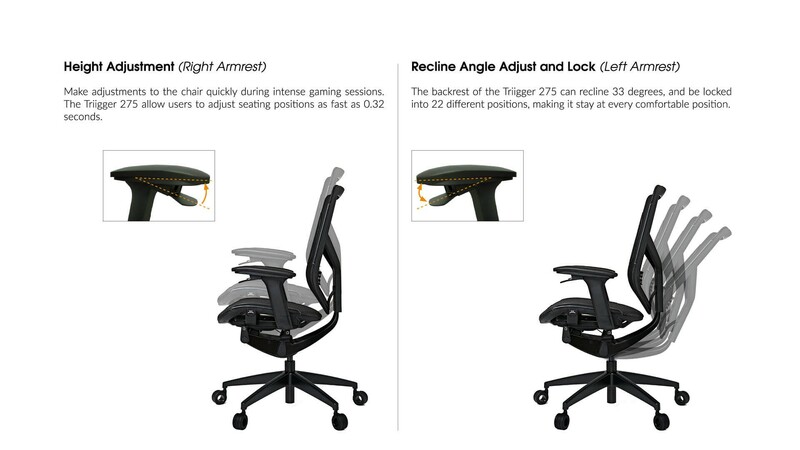 The Triigger 275 allow users to adjust seating positions as fast as 0.32 seconds. Recline Angle Adjust and Lock (Left Armrest) The backrest of the Triigger 275 can recline 33 degrees, and be locked into 22 different positions, making it stay at every comfortable position. Adjustable Seat Depth Pushing and holding the seat depth adjustment button at the left side of the seat allow users to slide the seat back and forth, giving users to have a more flexible seat depth. Height Adjustable Back and Lumbar Support The height of the backrest can be adjusted with a simple pull and lock system. 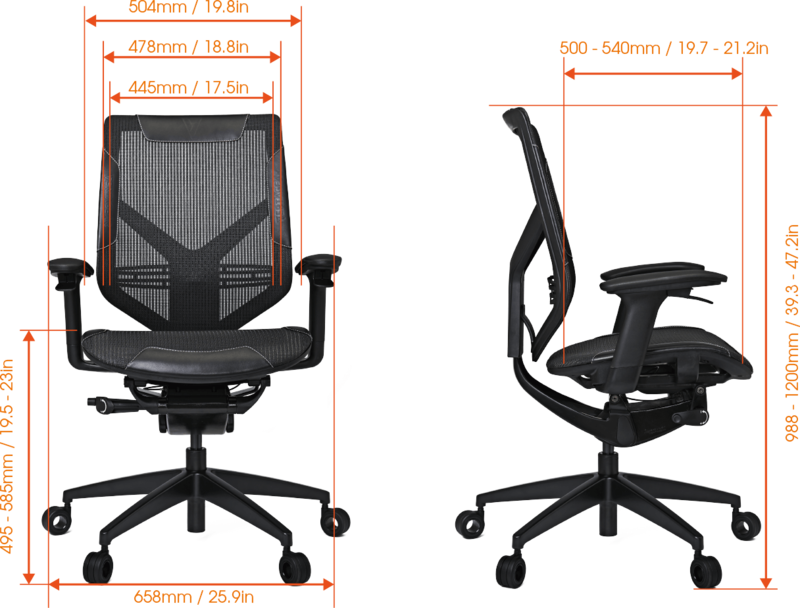 In addition, the built-in lumbar support on the Triigger 275 is also height adjustable in combination with the backrest. Tilt Tension Adjustment Easily adjust the chair’s tilt tension by turning the lever at the right side of the hub clockwise or anti-clockwise. 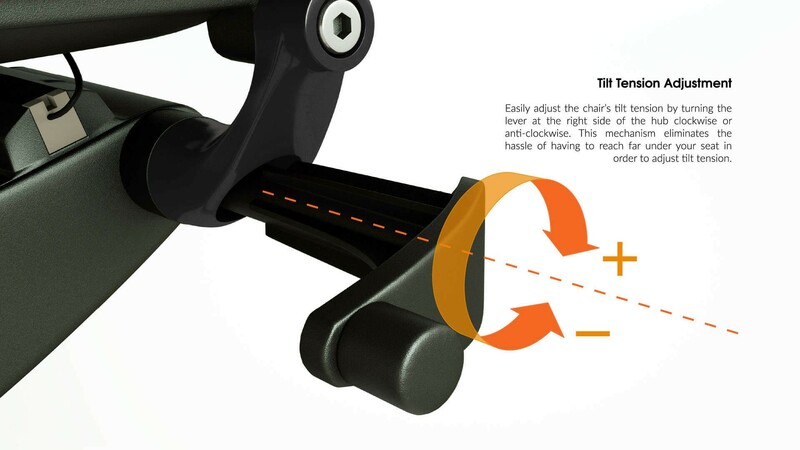 This mechanism eliminates the hassle of having to reach far under your seat in order to adjust tilt tension. 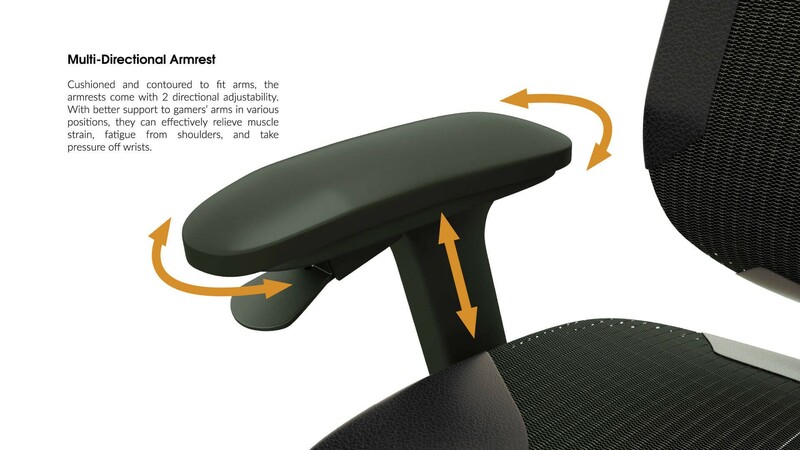 Multi-Directional Armrest Cushioned and contoured to fit arms, the armrests come with 2 directional adjustability. With better support to gamers’ arms in various positions, they can effectively relieve muscle strain, fatigue from shoulders, and take pressure off wrists. 12.9 class is one of the strongest screws you can find in non-military products. It has proof load of 970 MPa or 140,000 PSI, which is 20,000 more than the US standard Grade 8 at 120,000 PSI. All gaming series chairs come with Holtron Hub-less Casters. The 65mm version features roller bearing for pleasing appearance and smooth operation. The Triigger 275 implements a rubber silencer in the cavity to dampen noise resulting from the friction between the shaft and cavity. This also prevents the caster from falling out by accident.